Thursday 22nd February 2024 - There has never been a more apt time to write a Marco & Remo diary post. This is because £43m rated 24 year old Marco Simon returns to the Letzigrund to face off against his boyhood club - Grasshopper Club Zürich (GCZ). 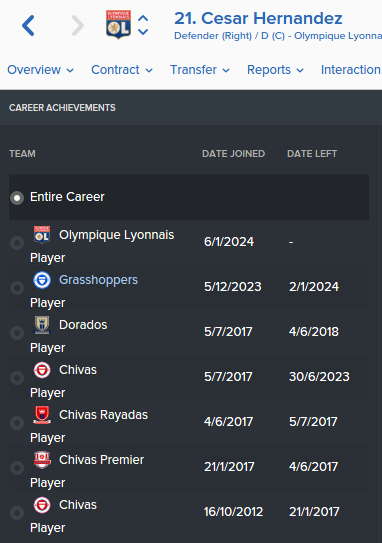 Marco now plays for Olympique Lyonnais (OL), and if you are yet to read his journey to stardom...see the previous 5 blog posts below. During the Part V, I had pretty much lost all hope of bringing back Marco Simon to the Letzigrund. Marco now commands a World Class transfer fee and because of the Financial Fair Play Fiasco outlined last week...it's near on impossible to bring him back. However, this saves unpredictability can never be questioned...as in December 2023, I was drawn against Marco's OL side in the 1st Knockout Round of the Euro Cup. Marco was coming home. Today's blog therefore is a summary of our two legged skirmish. Remo Vs Marco, Zürich's two prodigious talents. On a wet Thursday night a near capacity crowd of 24,581 turned up to see Marco Simon play a decisive role in a 1-1 draw between the two clubs. Marco played in a narrow 4-4-2 diamond. He played with all the Box-to-Box traits that I had added to his game since he was 16, with 43 completed passes with 6 being key. He mixed up his game and covered the 3 midfield stratas with ease. All despite my best efforts to close down at all times and tackle hard. Marco simply showed his class. 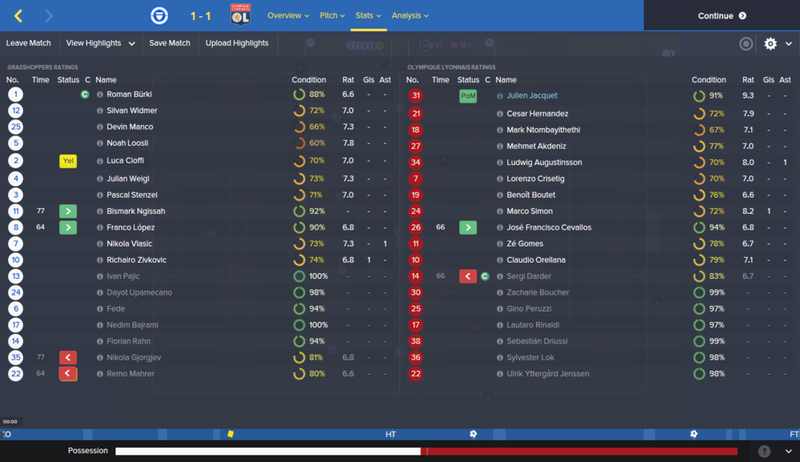 The game was pretty even, and I had my chance to seal a vital victory when Noah Loosli was tripped in the box on 87 minutes. 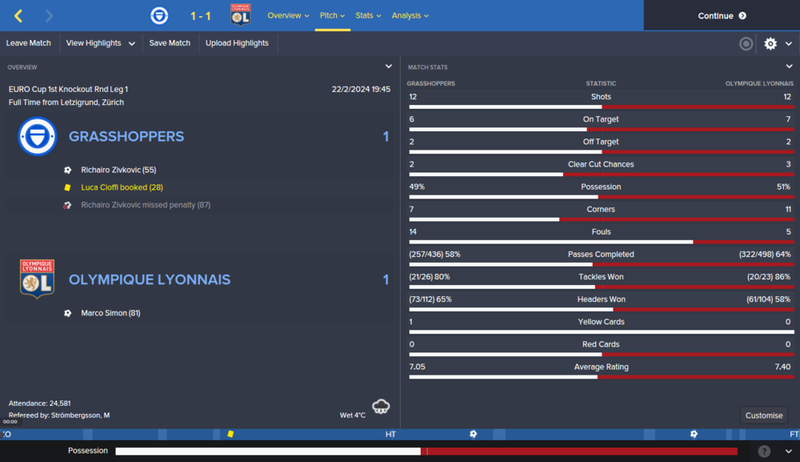 Sadly Richairo Zivkovic couldn't make it count, with Super Regen Keeper Julien Jacquet saving well. I entered the 2nd leg in buoyant mood, despite not having a left back (loan Regen Luca Cioffi was suspended) and Remo Mahrer ruled out through injury. Last year we had gone away to Monaco and won 2-1 and our away form this year in the league had been red hot (7-1 away win at Young Boys and 5-0 away win at Basel). The mentality of those matches was to attack but I had to be conscious of OL's attacking threats - they already had the important away goal and could counter me. GCZ lined up with a disciplined focused 4-4-1-1 with two DMs. I had to counter Mexican Right Back regen Cesar Hernandez's ferocity. Cesar was a trialist only a month ago at GCZ, but I couldn't conclude the deal due to FFP and him wanting £60k wages per week. My Left Back area was decimated so Centre Back Dayot Upamecano played with Vlasic's attacking talents being sacrificed for a Defensive Winger role on man mark duty. I don't normally go to these great lengths to stop a player, but with no recognised Left Back in the squad...I was compelled to do so. Marco Simon proved in the previous match that he can bypass my micro-management skills, so I left him untouched and decided to punt on Julian Weigl & Fede causing the AI problems. Richairo Zivkovic makes up for the 1st leg penalty miss! ...We did it! 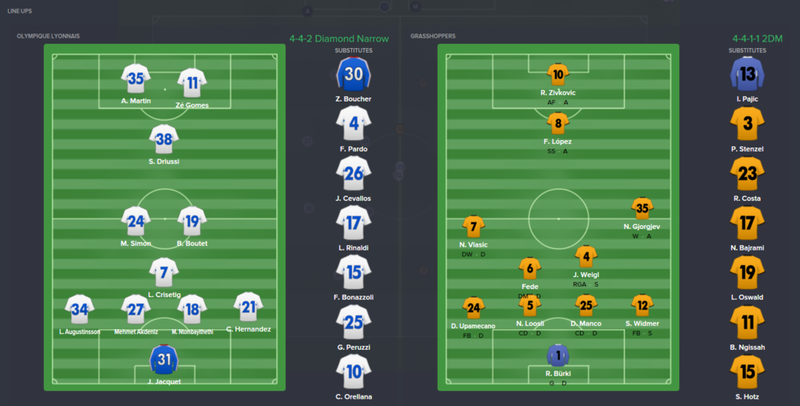 A solitary strike from Richairo Zivkovic was enough to see us through. In truth, the game way scrappy and I rode my luck on numerous occasions. But I am happy that tactically my left side weaknesses were not exposed - I had to sacrifice a lot of my attacking threat but it paid off. My first European Knockout progression for 3 years. Marco Simon had a standout game, despite not progressing with OL into the next round. He gave a Man Of The Match performance, with 63 completed passes with 9 key. He also dominated physically, winning 13 of the 15 headers attempted. It was Marco that dominated the midfield once again, not me. But football is a cruel game and GCZ progress.